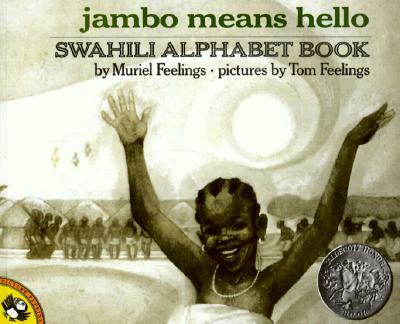 Jambo Means Hello introduces children to the Swahili alphabet with helpful pronunciation keys, while presenting East African culture and lifestyles through an easy-to-understand narrative and vivid illustrations. Tom Feelings, well-known illustrator and artist, was born in Brooklyn, New York, and attended the School of Visual Arts. In 1971 Mr. Feelings became the first African-American artist to win a Caldecott Honor with his illustrations for Moja Means One. Among the other award-winning books he has illustrated are To Be a Slave, a Newbery Honor Book by Julius Lester, and the Coretta Scott King-award winner Soul Looks Back in Wonder, a celebration of African-American creativity for which such distinguished writers as Maya Angelou, Margaret Walker, and Walter Dean Myers wrote poems. Mr. Feelings passed away in August 2003.